Posted by Weird Science Writer in Environment, Human Body, Technology, Think About It. When Kelsey Abbott first heard that two students had created a new kind of farm – one with no animals – she set out to investigate just what sorts of tricks they had up their sleeves. She was surprised to find out that this was actually a farm for people! Credit: This very futuristic graphic is courtesy of the Massachusetts Institute of Technology – School of Architecture and Planning. Remember Old McDonald and his farm? He had a cow (with a moo-moo here and a moo-moo there) and a pig (with an oink-oink here and an oink-oink there) and every other animal that could make a fun noise. Farming has come a long way since Old McDonald’s days. Now, there are wind farms, wave farms and soon there will be the Crowd Farm! James Graham and Thaddeus Jusczyk, two architecture graduate students at the Massachusetts Institute of Technology, just won an international award for their plan to create a Crowd Farm. 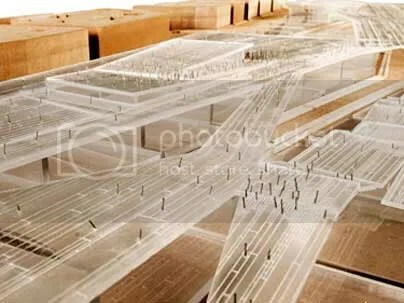 The Crowd Farm would convert the energy of footsteps into another form of energy – electricity. If one person took just one step in the Crowd Farm, it could power two 60-watt light bulbs for one second. That’s not very impressive, but if everyone within a crowd of people (let’s say 28,527 people) took one step, it would make enough electricity to power a moving train for one second. Remember, that’s only one step. If all those people kept walking, they could keep the train moving. We all walk on different sorts of surfaces every day, and we’re remarkably adept at dealing with them all. Dress shoes vs. running shoes, concrete vs. soft earth; each of these has a different feel. We don’t see the Crowd Farm as being too far from the sorts of materials we’re accustomed to walking on. Basically, a dynamo is a means of taking kinetic energy – movement – and turning it into electrical energy. You can think of it as the opposite of a ceiling fan – instead of using electricity to turn the rotor, you’re the one turning the rotor, which in turn generates energy. If people could produce all this power just by walking, could they produce even more power by running? And if so, could you make a basketball court out of the Crowd Farm floor and have it power the entire arena? Not quite. Sure – the amount of force that acts on the flooring will impact the amount of energy that can be produced. A basketball court would be tough, because those ten people playing would have to work impossibly hard to produce that much. But, if you used it at the exits and harnessed the energy of 17,000 people leaving Madison Square Garden, for example, you can start to get somewhere. You may have heard of climate change – it’s also called global warming. We’re supposed to have some greenhouse gases in our atmosphere, which trap the sun’s heat to keep the Earth warm. But now we have too many greenhouse gases. They’re keeping too much heat close to the Earth. Where are the extra greenhouse gases coming from? One-third of the global warming pollution in the United States (U.S.) comes from burning fossil fuels like coal and oil. And get this – coal and oil account for about 97% of the electricity in the U.S.! If we can reduce the amount of fossil fuels we’re pumping into the atmosphere, we can help to fight global warming. Of course, we need electricity to do all sorts of things, like read this blog. So, how can we reduce fossil fuels? One way is through sustainable or renewable energy. Many people are switching to wind power or solar power. James and Thaddeus hope to harness the power of the crowd. The Crowd Farm won’t be able to power entire cities, but James and Thaddeus hope it will make people think about their energy use. We all imagine that walking is a graceful and economical process, but in a lot of ways, it’s very inefficient. Crowd Farming certainly isn’t the easiest way to harvest energy and it has definite limits, but there are specific sorts of situations where you can have a dense enough crowd to make a meaningful contribution. We see it as a means of provoking people to think about energy and their individual role in its use and production, but it could never be the next great energy source. Some things, like cell phone and ipod chargers use energy whenever they’re plugged in, so if you’re not charging your phone or ipod, unplug the charger. Always remember to turn off the lights when you leave a room. Walk or bike rather than taking the bus or getting a car ride to your destination. These are just a few easy (and free!) things you can do to reduce your family’s energy use (and the electric bill!). The National Resources Defense Council has some nifty tips for reducing energy consumption. P.S. If your computer use is done for the day, don’t forget to log off and shut it down when you’re finished reading this blog! Kelsey Abbott is a marine biologist and freelance writer in Maine. She drinks tap water from a wide assortment of Nalgene bottles and bike bottles. She also picks up her dog’s poop with biodegradable plastic bags!